Schwinn’s new range of electric bikes are finally available. These innovative bikes have electric motors and batteries integrated seamlessly into their design. Schwinn claims that the four pound Protanium® lithium polymer battery included with these bikes is the lightest and most durable on the market. One charge will last 40-60 miles. The battery also charges faster than those found on most electric bikes — they become fully charged in less than four hours. You detach the batteries to charge them, so there are no wires on the bike itself. The bikes use a 250 watts max electric hub motor in the front wheel, controlled by a throttle on the handlebar which can propel the bike up to 18 mph. At MetaEfficient, we like electric bikes because they extend your travel range, thus make it more feasible to ride a bike across town, in place of a car. The bikes come in men’s and women’s versions, and they range in price from $1500 to $2000. They are available from: Bike Source US (NJ) and Electric Cyclery. Great to see the Schwinn Electric bikes now on sale, although not yet in the UK. 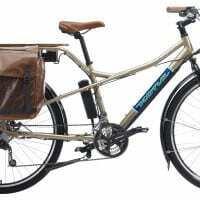 Still, recommend Kalkhoff with the panasonic crank-drive motor. Lots of praise over here! I’m about to purchase the GSE model and very impress about the information you posted about the GSE didn’t have any problems with steep hills. I was woundering do you guy’s have two batteries for the GSE . Also, what is the longest ride with one charge..? I’m about to purchase the GSE model and very impress about the information you posted about the GSE didn’t have any plobles with steep hills. I was woundering do you guy’s have two batteries for the GSE . Also, what is the longest ride with one charge..? Just bought one from Bikeattack in Santa Monica California. I ordered it without knowing much about it. I must say it is a lot bigger than I expected and a lot heavier to carry around. At these prices it’s not a bike you want to leave around an alley even with a lock. The performance is quite amazing. Ilike how I sit up high and keep my neck straight..There are no hills in Santa Monica so wouldn’t know about how it perform uphill. Just got it today so no complaints yet…I feel like ET going towards the moon when I ride it…pretty cool ride so far!!! Just got my wife the World GSE three weeks ago. We are in Colorado for a week and did two rides: Platte River trail (relatively flat, paved) from 104th Ave to REI downtown (about 10 miles each way). She had no trouble keeping up with me, and actually turned off the motor for part of the trip. Yesterday we rode up Boulder Canyon Trail in Boulder (CO). Trail is paved part way and then a well packed gravel. Quite a steep upgrade for several miles and she had no problem keeping up. However, on the downhill something was jarred loose and she found that there was no power to her handlebar controller. Battery still was 3/4 charge. Talked to a Schminn tech over the phone and he thinks it is the controller box mounted in front of the battery over the rear wheel. Bike is great expect for this glitch. However, my wife is short (5’2″) and the women’s model is a bit large for her. Bike seemlessly adds power as needed on hills. Very well laid out controls. Can they climb a steep hill? I have had two EVGlo bal e bikes, a 24 volt with a 400 watt motor and a 36 volt with a 500 watt motor. I can climb hills well with the latter but had problems with the 400 watt motor. The Schwinn only has a 180 watt (250 watt) peak motor. I’ m skeptical it can climb steep hills. Has anyone had any experience with this? This Schwinn Continental looks good but I want to ask if anyone has experience with it. Do you think it would work for: a 18.5 mile commute in to work, then back with a 1250 foot gain in elevation, with some climbs that are steep. I am 53 and in shape but while I can, the grind of the return commute discourages me from riding a bike regularly to work. These bikes are really great and i’m sure its only going to get better and better as these are the first round of Electric Bikes Schwinn has produced. As far as the problems people have talked about I have not heard much of any and we sell them.. One guy came back with his and we had to totally rebuild it, but that’s wasn’t because of the bike, it was because someone threw it in a lake… sad story, but hey it worked great before, and works great now! OMG, I love, love, love this bike. Have had it in hand for one week. I was out on it for about 5 hours yesterday. Did some shopping. Took in a jazz band in the park. Rides beautifully as a 24 speed. Turned on the motor for hills. By the mid-day I was actually riding around looking for the hilliest route home. Streets that I absolutely avioded before are no problem, now. One learning was to let go and let the bike help. I was actually working too hard to go up a major intown hill. Once I moved to a lower gear the bike kicked it and made it a breeze. I just converted to commuting for “Commute Another Way” week last week. Took the bus two days and road the two days. This is great so far, hoping to stick to it and will soon being joining a local bike commuter group. The bikes really are incredible! If you ride one you will buy one. Any feedback since these became avaialble for sale on the west coast ? I’ve pu aside the dollars. Now just need to choose between Schwinn and Kalkhoff. Apparently the cost of shipping the Pro Connect from 50 cycles in England will not be very much more then getting hands on a Schwinn from CA. These Schwinn electric bikes may not too reliable, i read a review at http://www.atob.org.uk/Electric_Buyers'_Guide.html where the controller burnt out after a few miles. The battery isn’t up to it either, cuts out on hills. Shame, because it’s a beautiful machine. But a pretty bike does not make a good electric bike. It looks to me like these are one-speed bikes – why would they not offer multiple gearing ratios?